Growing up, family road trips involved a lot of singing, travel bingo, pinching my brothers for crossing imaginary borders on the seats, and pit stops. While we kids ventured to try new sweets, mom stuck to French burnt peanuts. As for dad, he would pass on his standard almond chocolate bar if a bag of homemade peanut brittle was for sale. His adoration of peanut brittle is known amongst close friends and family. If dad is at a county fair, you can bet he will hunt down the award winning brittle to taste and take home. Another treat my dad loves, cookies. This recipe combines both of dad’s loves in one heavenly serving (hence the dedicated title). It is savoury, sweet, and succulent with each crunchy bite. I look forward to making dad a batch on my next visit home! 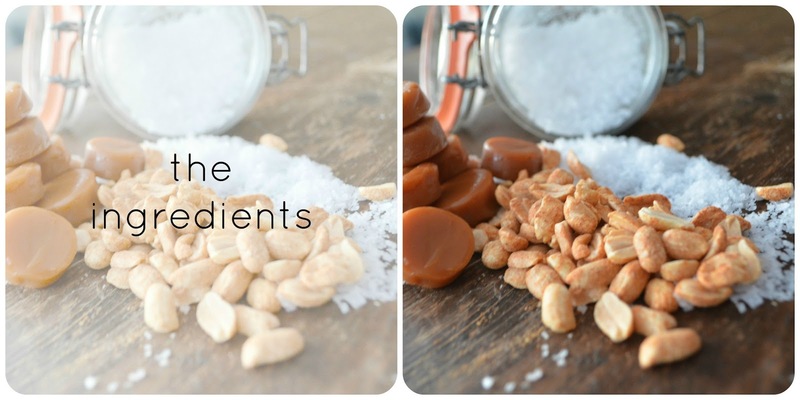 The keys to success are: good unsalted butter, dry roasted peanuts, soft caramel (toffee), and good quality sea salt. I recommend Maldon Sea Salt which is a reputable brand and available in most stores. For added WOW! Maldon Smoked Sea Salt brings out the contrasting flavours of sweet, nut and salt. For peanut allergies, this cookie is just as enjoyable with caramel and sea salt. Cream butter and sugars in KitchenAid fitted with flat beater. Batter should be fluffy and pale yellow in colour. Approximately 5-7 minutes on medium to medium-high speed. In a separate bowl sift together the flour, baking powder, and baking soda. Set aside. Split vanilla beans and scrape out vanilla pods with a knife. Add vanilla to butter and sugars. Reduce speed on KitchenAid and gradually fold in dry ingredients. Mix until batter just comes together. 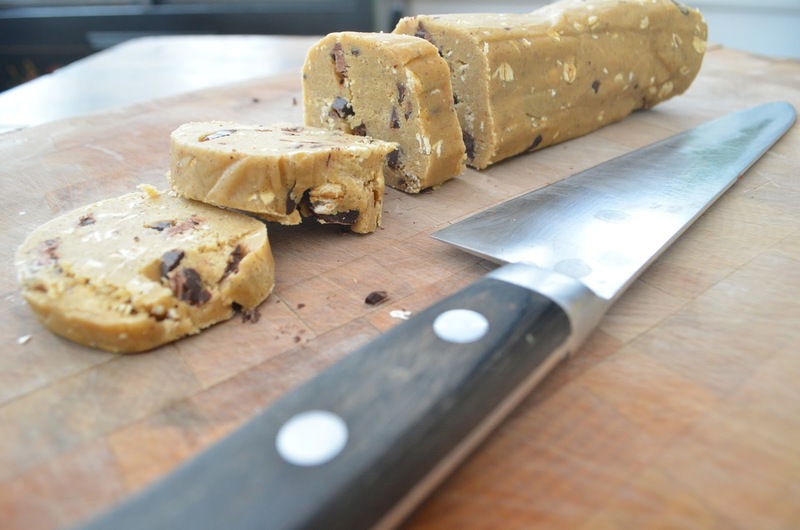 Chop toffee (caramel) into small bite size chunks and fold into batter with rubber spatula. refrigerate for at least one hour. If you wish to bake later, wrap tightly in cling film to prevent dough from drying out. Cut dough into 1/2″ pieces. If prefer smaller cookies, halve the piece. Place cookies on non-stick baking tray. Place 4-6 peanuts* on top of each cookie and sprinkle a pinch of sea salt. Bake for 8-10 minutes or until cookies are just golden. Let the cookies rest on tray for a few minutes before transferring to cooling rack. Once cooled, store in an airtight container to preserve freshness. 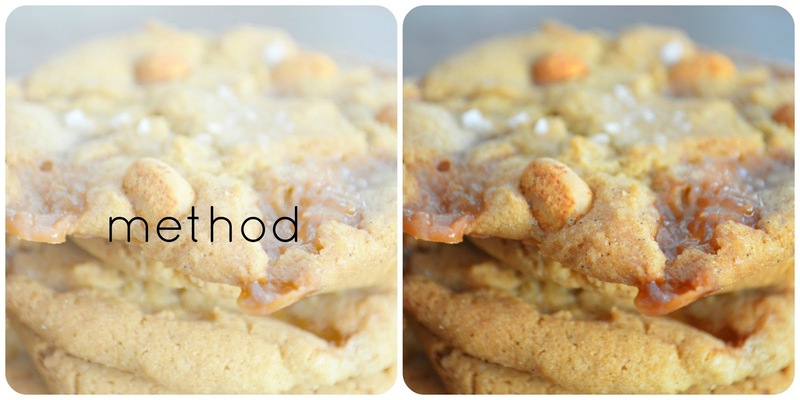 * Tip: space the peanuts around cookie for perfect bite combination of cookie, caramel, peanut, and salt. Enjoy cookie with a nice lager… after all, beer and peanuts are old pals. I might have to make a special trip to the State Fair of Texas this September and enter this cookie in the competition. I think she’s a blue ribbon winner. Y’all let me know if your taste buds are smitten, too! These look so delicious, Callie! I'm gonna have to try them! Molly, I hope you do give these a try– a winning combo! Thanks so much for your comment— I have enjoyed looking through The Nesting Game blog and your creativity inspires me!